This Linux laptop available via a build-to-order system comes in 11.6- and 14-inch models, its specs including a 64-bit Allwinner A64 quad-core processor, 2 GB RAM, 16 GB eMMC internal storage, a full-size keyboard, as well as a touchpad with multitouch input support. PINE64 unveiled the Pinebook Linux laptop back in November, and now this cheap machine is ready to ship. PINE64 is known for the Pine A64 single-board computer, and the Pinebook uses the same Allwinner A64 processor as its $15 USD sibling. Although the Pinebook comes in two sizes, their specs are similar, including the resolution of the TN panel - 1,366X768 pixels. The other highlights include the Allwinner A64 processor with four ARM Cortex-A53 cores, 2 GB RAM, 16 GB eMMC internal storage and microSD support, WiFi 802.11 b/g/n, Bluetooth 4.0, 2XUSB 2.0 connectivity, as well as a mini HDMI port. 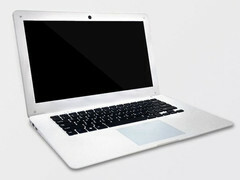 The Pinebook's power comes from a 10,000 mAh battery, and the dimensions are 11.8X7.9X0.5 inches or 13X8.7X0.5 inches. The smaller Pinebook weighs 2.3 pounds, while the 14-inch one has 2.8 pounds. To buy a Pinebook, those interested should enter the desired screen size and their email address so the sales team can contact them before actually placing the order. Shipping to the US costs $29 USD and the price of the Pinebook starts at $89 USD and $99 USD, depending on the screen size. Sadly, returns are not accepted and there is only a 30-day warranty.